After pretty much taking a break from climbing for a few weeks due to a school trip and a short vacation with my dad, I’ve been superpsyched to get on rock again. Although I still haven’t really found a new project, I enjoyed hanging out in Magic Wood the last couple of weekends. I guess I simply love being out there, no matter what and how hard I climb. The weather was mostly good, conditions even better and since the summer hype was finally over, it was nice to find the forest quiet and peaceful again. You most likely know the few people you come across and don’t have to get in line to try a problem. Who seems to understand that conditions are way better now than in summer are the Americans, among them Carlo Traversi finishing off the hardest problems in the woods within two weeks, getting stopped only by the snow now taking over Magic Wood. For me, it’s really inspiring to see such strong people climb, it makes me realize what is actually possible and makes me wanna try harder and see where my own limits are. After another hopeless attempt on the sit start of Mariuhana Corner (7A+), I started wondering if this might be my limit. I’ve never considered it as a serious project but still tried it a few times all over the year and hardly made any progress. It’s already a bit tricky to get off the ground and the second move using an intermediate feels really hard to me. Just as I decided I might have to face the fact that I won’t climb this problem within the near future, I gave it one last try and surprisingly stuck the move and therewith finished the whole boulder. Although it’s only graded 7A+, this just made my day, it always feels good climbing something you’ve tried over a longer period. Yet I have to admit, it’s definitely not one of my favorite problems and I probably won’t get on it ever again, it uses up all your skin and there are so many better lines right next to it. I’ve been back to school for a week now and I’m already completely weary of it. Thank god I got the afternoons off for training and since winter is setting in this weekend, we decided to have at least one last afternoon in Magic Wood on Thursday. We didn’t have too much time since it’s already getting dark early again but I knew I wanted to have another try on Exclusive (7B). It has a really reachy cross move in the beginning but thanks to a high heel hook I figured out the start and after a couple of tries could do the whole problem! 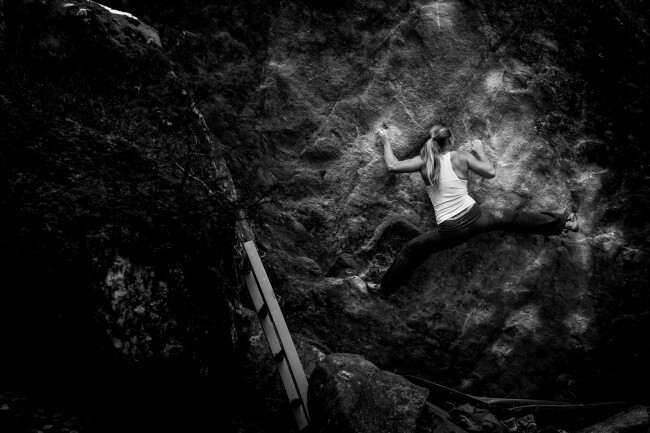 After that, Remo figured out all the moves on One Summer in Paradise (8B) and got quite close to sending it. To make the day complete, we spent the rest of the evening with friends and had pizza in Chur, that’s how life should be all year round… Bye bye Magic Wood, see you next year, I can’t wait!